The Freckled Fox & Friends: Canon Rebel T31 DSLR Camera Giveaway! Such a great camera! I know because it’s one that I use just about every day:) I know that I speak for most of us when I say that my biggest push in professionalism for my shop and my blog was getting my first really awesome camera, and what could be better than having one delivered to your front door completely free?! Even if you already have a DSLR or maybe photography isn’t exactly your thing, you always can use a back-up camera, and think what an amazing gift this would make for that friend or relative that’s been saving for one! Well now on to the ladies and shops that are responsible for bringing you this fabulous prize today: my beautiful and creative sponsors! I love love having this opportunity to introduce them to you guys. They’re such a genuine and creative group, and I’m so grateful for their support and for the chance at partnering up! So, please click through and introduce yourselves, and don’t forget the rafflecopter at the bottom! Notes: The giveaway will run for ten days, the winner will be selected at random, contacted, and announced shortly after the giveaway concludes in this post as well as on all Freckled Fox social media channels. Yes this is open internationally! entries will be verified. There it is folks! Tons of different ways to enter with this one huh? Remember that the more entries you complete the better your chance of winning this beauty! Also as a special bonus, each entry is a new way to meet and support the bloggers who are bringing you this giveaway, and they’re huge supports to me, so it’s basically one big support/love fest that you should join in on. haha See what I did there? 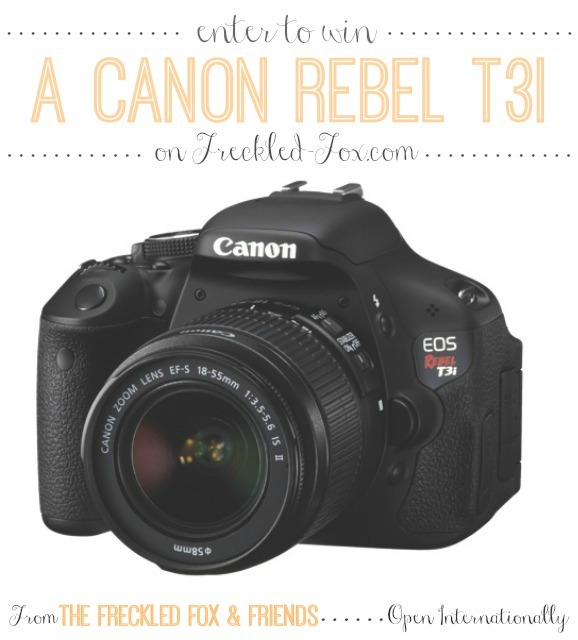 Share the post "The Freckled Fox & Friends: Canon Rebel T31 DSLR Camera Giveaway!" I would take lots of pictures of my cat! Oh my goodness if I won this I would be over the moon excited 😉 I don’t know what is up with me but I have had I think three or four cameras since I had my son and all of them have messed. Two messed up the same day, when I was suppose to be taking pictures for a blog post I was doing…. If I won I would take so MANY pictures of my kids and I would use it for taking pictures for my blog and shop. Also I want to say thank you so MUCH to the ladies sponsoring this giveaway. It is super awesome. i WOULD LOVE TO USE THE CAMERA FOR PICS OF MY BABY GIRL THAT’S DUE NEXT MONTH! If I won, I’d take the most pictures of my two girls. i always feel like i don’t capture enough of their antics. I blog, but my camera is so terrible, I spend most of my time color-correcting in Photoshop. I would love to win this camera to boost my pics to the next level with less fuss! Thanks for the amazing giveaway! would be taking pictures of my last few months of pregnancy with baby #3 and then of all three of my children together enjoying the beautiful city of charleston where we live ! !